Gabriel Bol Deng, who is one of the “Lost Boys of Sudan,the children who walked from their burning villages in South Sudan all the way to refugee camps in Kenya more than 20 years ago, visited with the Benedict News staff on March 12. After talking about his harrowing childhood and eventual journey to the United States, he told the students about his life’s mission. Building a school. That mission was sparked when he returned to his village, Ariang, after 20 years. The village was barely what he remembered and was in dire need of a school. He started small and asked his professor from Le Moyne College in Syracuse, New York for assistance. He astarted the Hope for Ariang Foundation to raise funds for the school. for his first fundraiser, his professor paid for 200 shirts for the foundation. The school’s humble beginnings are what led it to be what it is today. Today, the school is complete. It houses 500 students, 200 of which are girls. The school is outfitted with everything a school needs to run: chalk, chalkboards, writing materials, even lunch. 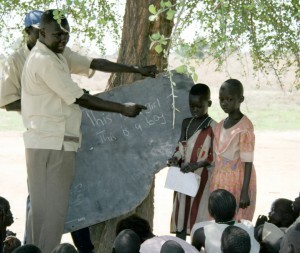 The students also learn in English, as English is the official language of South Sudan. However, there are still many challenges that students face. Women, for example, are in charge of gathering water for the family in the mornings. Before, they used to walk miles to get water. Now, Mr. Bol Deng and villagers dug wells near the villages, so that women don’t have to travel as far to retrieve water. Even then, students still face many other challenges, such walking two and a half hours to get to school. That, however, doesn’t stop them from going. “I knew it was bad [in African countries], but Mr. Bol Deng’s description put me in his shoes,” said senior Muqkadeen Poole. Mr. Bol Deng’s story has touched many. It gave a concrete idea of the challenges in African countries. “He was starting from nothing,” said journalism teacher Noreen Connolly. she said St. Benedict’s Prep and Mr. Bol Deng’s school aren’t too different. While Mr. Bol Deng’s school is technically a government school, it does not receive funding from the government. The South Sudanese government spends much of its money on military funds, leaving Mr. Bol Deng’s school to find funding elsewhere.